Maybe an app of this kind is a venture that Nathan's Intellectual Ventures could invest in? Nathan, if you are reading this, perhaps bundling the app with copies of Modernist Cuisine could be an option? Douglas, you point out that thermal diffusivity in food undergoing a phase-transition (frozen-to-thawed) is nonlinear. When I think nonlinear systems, I think of chaos, the weather, things like that. I'm supposing that the reason it is nonlinear is that a thawing substance is more complex than a steady-state piece of meat (or whatever) since it has lots of micro-regions in different states, all interacting with each other. But as it thaws, complexity reduces, it becomes homogenous, and thermal diffusivity gradually turns linear. Fascinating! Happy New Year to all sous viders! 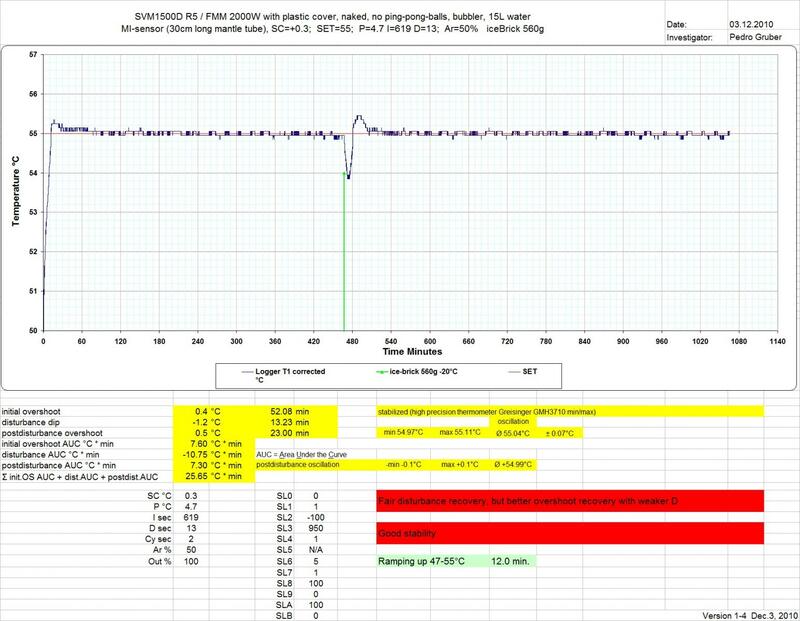 With the new 1500D controllers from FMS, up to Software version R4 the P-band could only be set in integer degrees; P=0010 meant P=10°C (or F). This was of no concern with rice cookers (well-insulated with high power and high thermal inertia) which required very large P-bands like 10°C (P=0010) to avoid overshoot, but with less well insulated, lower wattage cookers requiring very narrow P-bands, this used to be a disadvantage. Especially with the FreshMealsMagic (high power, poor insulation with the original polycarbonate container, and very small thermal inertia as a consequence of the heating element being immersed in the water) the P-band could not be set low enough to provoke oscillation, so typical closed-loop-tuning was not possible. Now finally with software version R5, the P-band can be set in decimals, i.e. P=000.5 means P=0.5°C. With a very large P-band, excellent stability is achieved, which gradually deteriorates with smaller P-bands; from P=0.5 to P=0.2 there is a discontinuity in the relation of P-band and stability, so with P=0.2°C there is obvious oscillation. I use P=20°C to have an ultra-stable bath for sensor calibration purposes, but not for practical cooking. The following two test runs with P=0.5°C and P=0.6°C show that with a fast-reacting cooker (FMM) running the PID-controller in P-only mode (zero integral term and zero derivative term) is sufficient to have fast ramping up, low overshoot, good stability and fast disturbance recovery, obviating the need to bother with further tuning on integral and derivative terms. P=0.5°C makes an extremely fast and responsive system with almost no negative offset at the price of only fair stability (±0.09°C, which is still far better than the ±0.4°C Douglas Baldwin mentions in his guide with a PID-controlled steam table water bath). P=0.6°C makes an almost equally responsive system with excellent stability (±0.04°C, which equals the stability of a circulating laboratory water bath mentioned by Douglas Baldwin in his guide) at the price of a 0.1°C negative offset. The third diagram shows the much slower disturbance recovery with classical PID-settings after auto-tuning. P=1°C, I=1800 sec, D=6 sec, Ar=30% yields no overshoot, very fast disturbance recovery und very good stability (±0.06°C). See the fourth diagram below. “Ar” is a parameter that mitigates integral action to avoid overshoot. With rice cookers, large P-bands are necessary to avoid overshoot; this results in considerable negative offset necessitating correction by an integral term and in slow disturbance recovery necessitating a derivative term to counteract disturbance. Optimal tuning of a rice cooker is obviously much more tedious than tuning an immersion heater like FMM. The last diagram shows no overshoot, very fast disturbance recovery und very good stability with P=1°C, I=1800 sec, D=6 sec, Ar=30%. This is the general topic for discussion of SV recipes, techniques, and equipment. Click here for the original SV topic; click here for the index for that topic and more. The index and the search engine will be important resources as you explore SV cooking. However, we open this topic for general discussion. Thomas Keller is pretty definite about excluding many green vegetables from sous vide, though his concern is in part preserving color. He prefers "big pot boiling" where one cooks just to the point of tenderness in a gigantic, very salty pot of boiling water, then plunges into ice water to arrest the cooking. This was one of the better home cooking lessons from The French Laundry Cookbook, reprised in Under Pressure. Greens like collards and kale aren't usually cooked like that. They're pretty tough, so they are generally braised for a long time. They certainly don't keep their vibrant color. Very successful experiment: 1.25 lb collards, stems removed, cut into ribbons, bagged with 2T butter, 1 hour @ 185. Although there was some loss of color per Keller, they were mighty darn fine greens, lush, silky with a heightened sweetness that I have never noticed in my traditional preparation. Having gone native he'ah in Cha'lut, I have been doing my greens in smoked-pork-infested water. I am going to experiment with some of my pulled pork bits in the bag (as I do with brussel sprouts), maybe (partially) substituting bacon fat for butter, hopefully not to overwhelm the sweetness. Color issue aside, worth a try. Whoever is able to develop a reusable vacuum bag will retire on a beach next to the folks who developed Cool-Ranch Doritos flavoring. These bags can be reused if light duty like 132F steaks for a few hours. I dont know if they would hold up for 2+ day baths though. I am very interested to start with sous vide cooking. But i have one main concern at that is boutulism. How likley Will it be to produce the deadly toxin if i cook like a piece of meat following the gguideline and Then eat it. If i get som leftovers i Will store it in a regular foodbox. Or is the real danger When u start to store cooked food in vaccum bags. Can there be a chans of botulism if Cook according to the guidlines and Then stored NOT in vaccum? See this section of Douglas Baldwin's practical guide to sous vide. Better still, read the whole document. It will answer not only this question but many others you may have about sous vide cooking. I have read it but since My english isnt that great I just want to doublecheck with u guys. If i understand it correct the safe way to cook sousvide is cook-hold. And Then if i get some leftovers it is safe to store them in the fridge in a none vaccum container? That way should be safe regarding botulism? It really depends on the level of hazard at each step of the process. This is how HACCP plans are worked out. You can cook hold and serve following the guidelines for holding to keep the food safe. You can also cook chill store using the guidelines given in that section of Douglas' guide. If the food is still sealed after your hold, you can cook hold chill store as long as your holding temperature was above 55C. As you are just starting to cook sous vide and have some difficulties reading English, I'd be getting Douglas' book "Sous Vide for the Home Cook" and following his guidelines for pasteurising the food. It is a bit more hazardous doing cook hold serve chill revacuum and freeze given the extra steps of chilling and thawing and adding what may now be non-pasteurised food to a vacuum. What you probably don't want to do is cook hold serve chill revacuum and the store in fridge. Ok, thanks for the reply, i think i am starting to get it now. So cook- hold the food. Then if u get any leftovers there is safe to store the in the fridge without vaccum, just like in a plastic container. But it is a big nono to revaccum and store already cooked food in the fridge? you can re-vacuum and store, but that's no better than plastic wrap or a plain plastic container. its not longer pasteurized. and you waste a vacuum bag. Acctualy My Only concern with this method (sous vide) of cooking is the risk of botulism. once they are left-overs, you treat them the same as any other left-overs. you can reheat them in that fashion, just not as a pasteurized keeper. Am i correct when i say that the deadly toxin only Can be created in a anaero enviorment? The botulinuum toxin does grow in an anaerobic environment but only if it is present in the first place. Pasteurisation reduces the likelihood of toxins, including botulism, being present to acceptable levels. There is science behind this but it is better just to say that pasteurisation leaves you with a product that is safe as long as you follow chilling and storage guidelines. So follow the guidelines to pasteurise the food, treat it appropriately and you will minimise your chances of food poisoning. Bottom line, if you have cooked something and opened the package treat the contents as you would any other leftovers. Do not reseal them under vacuum. If you have cooked something to pasteurisation, held it at an appropriate temperature, not opened the bag, and chilled it appropriately then it can be kept using the guidelines in Douglas' guide. I do alot of pre and post searing of meats when i SV. I find myself waisting alot of vacuum bags when i have to thaw them and cut them open to pre sear then re bag to cook. Im debating if it would be a good idea to pre sear, then quickly chill and freeze. This way i could just thaw and cook, or maybe even just go straight from fozen to cook and add an additional hour or two? Just looking for some thoughts on this if its safe. I see alot of food come frozen that are partially cooked, or flash fried but still raw inside. Why pre sear at all? Many of us don't. It is fine to cook from frozen. The additional time is dependent on the thickness of the product rather than just an arbitrary time. Bring to core temperature according to Douglas Baldwin's table 2.3. LTLT cooking (48h or the like) -> no significant difference when starting from frozen instead of fridge. Pasteurizing: thaw in a pot of ice-cold water in the fridge, then SV to pasteurizing conditions according to Douglas Baldwin's table 3.1 / 4.1 / 5.1 respectively. Turbo-aging: heat in a 39°C water bath for a time according to Douglas Baldwin's table 2.3 (calpains most active), then change setpoint to 49°C (cathepsins most active), two hours later change setpoint to final core temperature for a time according to the tables. Before post-searing, collect any drippings and add to the sauce (eventually after heating to coagulate and remove proteins), and dab dry for faster searing. Fastest searing is with rice bran oil (smoke point about 247°C) with the disadvantage of oil mist wafting all over your kitchen. I mainly pre sear steaks. I find that little bit of charred fat adds a bold flavor to the meat while cooking. It also gives the steak a nice color straight out of the bag, and sometimes i find no need to post sear. To each their own, but i swear by pre searing. I use a blow torch to do my searing. Pre searing takes 30 seconds per side and has no effect on outer ring color. Steaks come out med rare all the way through with no grey ring at all. Check out this post on Serious Eats. As far as I have seen when people run experiments with blind tasting there is no difference between pre-searing + post-searing and post-searing alone. I read that article over a year ago, and do not agree. I can definitely taste the difference between a 2 inch thick filet mignon that has been pre charred and cooked for 4 hours vs one that has not been pre charred. Anybody that know how to cook will tell you the best part of a sauce or gravy is the brown bits that get deglazed in the pan, when you char a steak and vacuum seal it, your basicly letting the steaks natural juices mix with those charred bits and marinate the steak as it cooks.